This was a collection of online comics by the creator of 9 Chickweed Lane, Brooke McEldowney. This started out as a short, holiday story that more or less grew into it's own story. 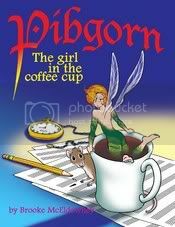 Pibgorn, an upstart of a fairy, falls in love with a human, Geoff (an organist for the local Episcopalian church, no less) who also happens to be the love-interest of Drusilla, an evil demon-fairy (or succubus). The prince of the fairies wants to kill Pibgorn, the lord of Hell wants to kill Drusilla and both of them want to win the heart of Geoff. In typical McEldowney fashion, watch the hilarity ensue.